Philip Fox II, 76, died unexpectedly in Bangor, Maine on Friday, October 4, as the result of a massive stroke. He was born September 1, 1937 in Boston, Mass, son of Bertrand Fox and Mary Kent (Ziegler) Fox. He grew up in Williamstown, MA, went to the Putney School in Vermont, Antioch College in Ohio and Wayne State University in Detroit, MI where he earned his PhD in Drama. He became an instructor at Wayne and was the manager of the university’s drama program and theater’s box office for 40 years. During this time he was a frequent actor in area and university productions, primarily at the Hillberry. Following his retirement from Wayne, he moved to Johnson City, Tennessee to join friends and enjoy a milder climate. Once there, Phil found new opportunities to act, and he joined the Johnson City Arts Council, a group from which he recently completed his term as president. He also became an active member of St Christopher’s Episcopal Church. In his retirement, Phil became a multi-month summer resident of Southwest Harbor, Maine, a place that became his emotional home and where he shared a summer house with his brothers, Tom and Ken and their families. He loved Mt Desert Island and Acadia National Park, where he rode his bicycle on the carriage paths and savored the ocean views. He became an active and favorite member of the Acadia Repertory Theater, appearing in many mysteries and comedies. He was an active member of the Causeway Club, a supporter of the Harbor House and a tour guide for visitors arriving on cruise ships. 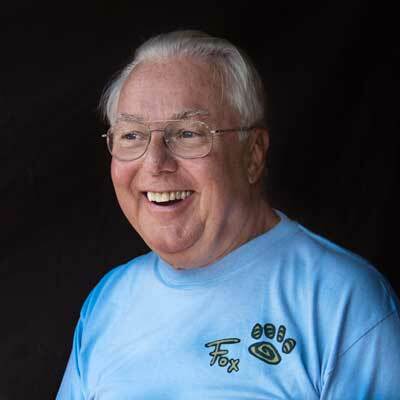 Phil was the loving elder of a 22-member Fox clan, made up of three brothers and two sisters, all with spouses, four nephews, four nieces, and their families. A celebration of his life will take place next summer in Maine, probably in early August. Other friends from Detroit and Johnson City are organizing similar gatherings. Memorial gifts can be made to The Acadia Repertory Theater, Harbor House in Southwest Harbor, the Phil Fox Endowment Fund at Wayne State University, the Johnson City Arts Council, or the Putney School, all favorite recipients of his generosity.